Chlorine bleach is used for all kinds of things in your home, from laundry stain removal, cleaning, deodorizing and even disinfecting. 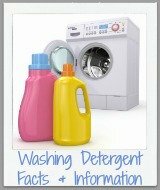 It is a staple for many homes in the laundry room and cleaning closet since it is so versatile, and also so inexpensive. However, I'm sure you know of someone (perhaps yourself) who has had a laundry mishap with this type of bleach, because it is very strong when undiluted, and can cause damage to fabric and other surfaces. Further, as a powerful chemical you've got to treat it with respect and follow safety rules to make sure you stay safe when using and storing it. 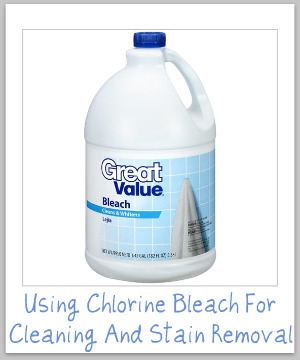 What follows in this article all about chlorine bleach is everything you've ever wanted to know (and most likely more) about this powerful cleaner and stain remover, so you can use it in your home properly and effectively. There are many types of bleach available, such as oxygen or color safe, each of which is made with various types of chemicals. However, when most people refer to "bleach", or "household bleach" they are referring to the most common and powerful version, which is sodium hypochlorite, with the chemical form of NaClO, which is the proper scientific name of chlorine bleach. Sodium hypochlorite works by liberating chlorine gas to oxidize or bleach stains. When you buy it from the store it typically comes in a 4-6% concentration, which is still actually quite strong, and therefore it must be diluted before use. One of the most common ways to use this product is for laundry stain removal. Keep the following instructions and information in mind whenever you use it for this purpose. 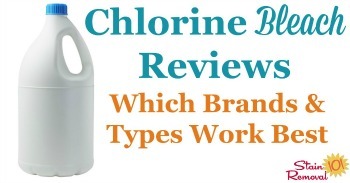 You should not use both chlorine and oxygen or color safe bleaches at the same time because the chlorine bleach will deactivate the oxygen versions in the detergent, and the oxygen bleach with not allow the household version to work as well either. Further, make sure any fabric you use this product on can take the rough treatment. If a fabric care label doesn't mention bleach it implies that using any kind of bleach on the item can be done safely. However, if the label says to only use color safe bleach, or no bleach, this is a definite no no for using household bleach, because you're basically guaranteed to ruin the item if you do. Many people think you can only use this product on whites. However, did you know chlorine bleach can also be used on certain colorfast colored fabric? I don't recommend doing this on a constant basis, because it will cause some fading over time, but if you've got a severely stained item using chlorine bleach may be the best way to remove the stain, even if the cloth is colored. Make sure to test the item for colorfastness before attempting to either presoak or wash the item with this type of bleach though, so you don't ruin it. (Here are instructions for how to test for colorfastness before using this type of bleach). Never add this product full strength into your washing machine, but instead dilute it first with water and then add it to the wash. This keeps it from touching any fabric in too high of a concentration and causing bleach spots. 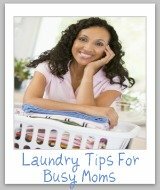 You should wait about five minutes into the washing cycle to add it to your machine if you must do so manually. The reason is that many detergents contain enzymes and brighteners to help clean your clothes. These go to work in about the first five minutes, and this type of bleach deactivates them. Therefore, let the enzymes do their job and then add the bleach thereafter. If your machine has a bleach dispenser you can add it that way, and the dispenser typically dilutes the bleach as it dispenses it a few minutes into the wash cycle. However, each brand of machine is different so check your owner's manual to make sure your machine does it this way. Once the bleach is in contact with the stains on your clothes it does not work instantaneously. Instead, it takes about five minutes after adding it to the wash for it to do its job. The process is faster in hot water and slower in cold water. Presoaking is an effective stain removal technique, and you can use chlorine bleach for certain jobs, not just non-chlorine versions. However, unlike with non-chlorine bleaches, where you may want to soak something for a long time, even overnight for example, you have to soak with this version of bleach only for a few minutes maximum. You can soak the whole garment for about five minutes in a solution of 1/4 cup of bleach and 1 gallon of cool water. Then, go ahead and wash the item right away since you really shouldn't soak for longer than that in chlorine bleach since prolonged exposure can weaken fibers too much, or cause too much color fading. An additional hint is that if you're soaking one half of a two piece item, soak both items so you don't have uneven fading. While this stuff is very powerful and effective, it can also cause problems, over time, with fabrics. Especially when used in too high of concentrations it can weaken fabrics and fibers over time. Further, even a tiny drop can spot or discolor colored fabric, so be careful when pouring it, especially in its undiluted form. In fact, if a spot of bleach is left on clothing for too long it can even make a hole in the fabric. If you ever accidentally splash or spill this product on fabric, especially in its undiluted form, your best bet is to act as quickly as possible and rinse the area, thereby diluting it and removing it from the fabric. The quicker you can do this, the less damage will most likely be done. Finally, if you use bleach in too high of concentrations over time it will actually begin to yellow your whites, which is actually the opposite of the result you want, so make sure to dilute it properly. You should avoid using this type of bleach if your water is high in iron (such as some types of well water), since the iron and bleach will cause a chemical reaction which can cause yellowing. Similarly, you should also never treat rust stains with chlorine bleach, since it will only set them, not remove them. In fact, another stain that it sets, not removes, is liquid laundry bluing, so if you've got blue spots on fabric from this product don't try to bleach them away. The other common use for household bleach is to clean, disinfect and deodorize. That means it is a common ingredient in many homemade cleaning products recipes, or household remedies. Really, more important than cleaning, bleach is important for disinfection, since it can kill bacteria, viruses, and even mold and mildew spores. Here is an article about sanitizing with bleach, which provides not only a recipe for homemade disinfectant, but also explains exactly how to use bleach to sanitize and disinfect. Unlike what many people think, killing these organisms is not instantaneous and there is a method for doing it properly and effectively. Further, as I mentioned above, bleach also kills mold and mildew, making it an important component in the fight against these stinky smelly organisms in your home. Therefore, I've also got a homemade mildew cleaner recipe here on the site you should check out if you're battling mold and mildew in your home, especially in your bathroom. As you can see by now, this product is quite powerful. That means it must also be treated with respect to make sure you're using it safely. The bleach you can buy in stores for home use is typically concentrated at about 4-6% sodium hypochlorite, with the most common percentage being 5.25%. This may not sound very strong, but it is actually still quite concentrated in that bottle. Therefore, you should never use the chlorine bleach in its undiluted form, but must always dilute it to a lower concentration. I've provided various dilution instructions that you can use for different purposes on this page, or within linked instructions to other recipes. Don't think that if a little works well, a lot will work better. Instead, it can be dangerous or harm the surface you're working on. 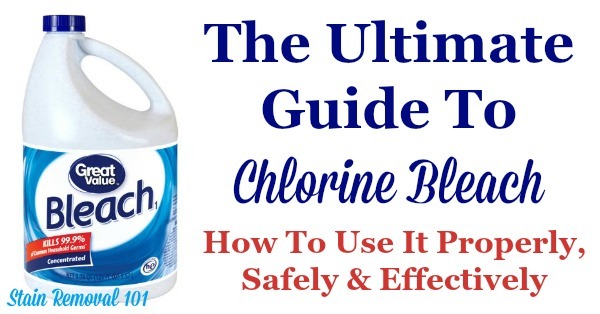 Another very important safety rule to always keep in mind is to never mix chlorine bleach with either ammonia or vinegar, since such a mixture of either can result in a highly poisonous gas. 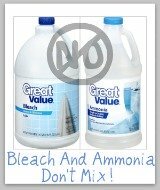 I've written an entire article about how bleach and ammonia don't mix, to help you understand the science behind this rule, so if you like to know the scientific explanations behind certain things go ahead and read that article now. In addition to the rules mentioned above, make sure to always wear old clothes, or an apron when using this cleaner and stain remover, to prevent harm to nice fabrics in case of a splash or drip, especially in its undiluted form. Household bleach, especially in undiluted concentrations, is also caustic to your skin, so always wear gloves when mixing and using it. Similarly, protect your eyes when pouring it, to prevent splashes. Also, mix and use it only in well ventilated areas in your home, since it can have a strong scent. Make sure to open a window, turn on a fan, or otherwise vent the area you're working in. Finally, as with all cleaning and laundry supplies, it should be stored out of the reach of children and pets. Most often household bleach is found in liquid form, but it can also come in granular or powdered form, in tablets, or even in gels. Gel bleaches, also known as splashless varieties, are formulated to avoid splattering and splashes so you can avoid some of the problems commonly associated with the product coming into contact accidentally with colored clothing or in too high a concentration. Recently, household bleach has even started being available in the form of a bleach pen. 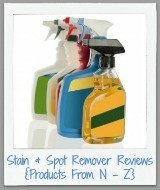 This allows you to spot treat a stain, and not have to treat the entire article of clothing. These pens have also been used to clean small areas, such as grout lines in tile. Further, the smell of plain chlorine bleach can be rather strong and overpowering, so many varities will add a scent to mask that strong odor, or to provide you with a nice scent for your cleaning or laundry needs. 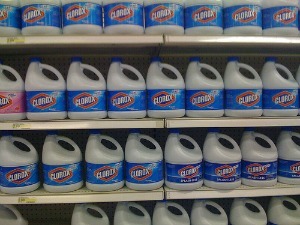 The most famous maker of chlorine bleach is Clorox, and they've got lots of versions of the product available for purchase. However, a money saving secret is that because of household bleach's chemical nature, since it is just a solution of sodium hypochlorite, there is not much difference between the Clorox name brand, which is more expensive, and some of the generic and store brand versions also available. You can easily save yourself money (like I do) and buy the store brand, and I've never noticed any difference. One word of caution though, is that you'll want to look at the packaging at the store and compare with Clorox bleach to make sure it is sold in the same concentration so you properly dilute it, and don't dilute it too much because a generic version could contain more water, for example, than a name brand. If it does contain more water it will tell you on the instructions the proper dilution amounts to work effectively. The chemical sodium hypochlorite actually degrades and breaks down relatively quickly. The result of this fact is that any time you make your own cleaning solution using household bleach you should use it all when freshly mixed and then throw the rest away. It is not the type of recipe you can mix and then save the rest for another use later. Further, if you're relying on this type of bleach for disinfection you should replace your supplies of it every six months, and for regular cleaning and laundry uses it should be replaced every 9-12 months. That means this is not the type of item to stock up on during a sale. However, that's not really a huge deal since it is relatively inexpensive all the time. Further, it is worth a glance at the expiration date on the jug or other container before you put it into your shopping cart. You never know how long its already been sitting on the shelf, so make sure you buy the freshest bottle possible. As effective as this type of bleach is, many people have decided, for ecological reasons, to avoid it. 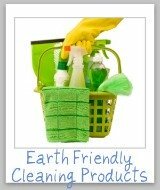 In fact, many eco-friendly cleaning products specifically avoid adding this ingredient to their cleaners and laundry supplies because of its harm to the environment. On the other hand, Clorox and other manufacturers of household bleach maintain that it is safe for use, and breaks down into salt which is not harmful to the environment. (Here's a link to bleach facts that I found by following links from the Clorox website). I will admit to being a little bit conflicted between these two positions, since someone is obviously wrong, and it is most likely a nuanced discussion that I'm not personally prepared to give my two cents on. Therefore, I will share with you that as a Mom, I try to keep my house both clean and safe for my kids and for future generations. As such, when I can use something else to clean or remove stains beside chlorine bleach I try to do that. But, on the other hand, I have not completely given up its use in my home. That is because chlorine bleach is still one of the most effective and cheapest ways to remove stains there is, and it sometimes is one of the only things that will work for your stains and disinfecting needs. You can disagree with me about this all you want, either way. I am still researching the issue, and maintain the right to change my mind in the future one way or the other about this product, but for now this is the compromise I have made based on the facts and information I currently possess. I encourage you to do your own research on the issue if you're concerned with bleach's impact on the environment. 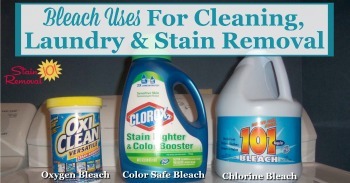 As you can see, there are lots of ways to use chlorine bleach for cleaning, laundry and stain removal in your home. I like to collect recipes and uses from readers, so I've created a page where you can share your bleach uses, or read ones that have already been submitted. There are quite a few cleaning recipes already provided. In addition, there are lots of brands of this product available, and also many scents and varieties, as mentioned above. 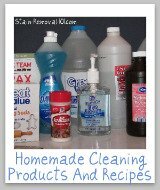 You can share your reviews of household bleach varieties here.